After dealing with a weekend sweep at the hands of Winthrop University, the Black Bears picked up their first win of the season, downing Central Connecticut State 6-3 from Del Ray, Fla. on Friday afternoon. The Black Bears struck first in the bottom of the second inning. Third-year designated hitter Christopher Bec led off with double and came around to score on another double by third-year catcher Jonathan Bennett. Bennett would advance to third on a ground out and then— after a walk by redshirt second-year Caleb Kerbs — would score as Kerbs got caught in a rundown between first and second. The run would extend the Black Bear lead to 2-0. Maine would add onto their lead in the third, started off by a single by fourth-year left fielder Lou Della Fera. Fourth-year right fielder Tyler Schwanz would single, putting two men on with nobody out. 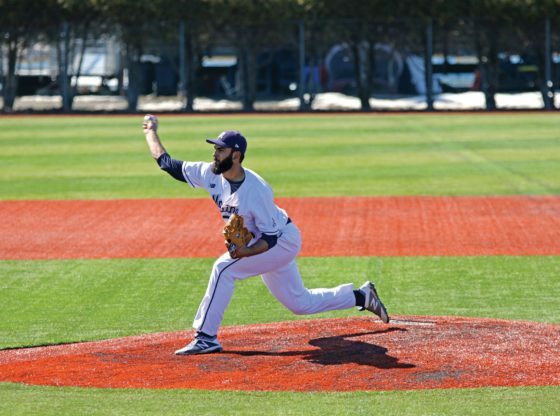 Second-year shortstop Jeremy Pena laid down an intended sacrifice bunt, but reached on a throwing error by Blue Devils first starting pitcher Mike Appel. The error would bring Della Fera home, running the score to 3-0 Black Bears. Second-year third baseman Danny Casals drove Schwanz in with a groundout to short, raising the score 4-0. For the third inning in a row, the Black Bears would tack on runs. Third-year center fielder Brandon Vicens led off with a single. He would move up to second after Appel uncorked a wild pitch, then reached third on a throwing error by second-year catcher Dylan Maher. A double by first-year first baseman Hernan Sardinas brought Vicens home, running the score to 5-0. A sacrifice bunt would move Sardinas to third with one out. Della Fera would then reach on an error by second baseman Ron Jackson, with Sardinas scampering home to run the score to 6-0. A single by Schwanz would be the end of the line for Appel, who gave up 7 hits and 6 runs (2 earned), while issuing one walk and striking out two. Central Connecticut would break up Courtney’s shutout in the 6th. Second-year shortstop Dean Lockery led off the inning with a double. He would then score on a double by second-year third baseman Ryan Costello, bringing the score to 6-1 Black Bears. The sixth would be the last inning Courtney (1-1) would go. He gave up one run on five hits, giving up two walks and striking out eight. After a clean seventh inning, redshirt third-year Zach Winn had some command issues in the eighth and the Blue Devils were able to capitalize. Designated hitter Terry Bowens would lead off with a walk, followed by an infield single by second-year left fielder Buddy Dewaine. A passed ball led to both runners moving into scoring position and then a wild pitch led to Bowen coming home to score, bringing the score to 6-2. A groundout would plate Dewaine and allow the Blue Devils to cut into the lead even further, bringing the score to 6-3. The Black Bears will look to start up a winning streak as they take on the South Dakota State University Jackrabbits on Saturday, March 4 at 11 a.m. The Black Bears garnered enough offense to pick up their second win of the season, downing South Dakota State University 4-3 from Del Ray, Fla. on Saturday. Maine (2-3) drew first blood in this game in the top of the second. After a groundout to start the inning, Bennett singled. n Vicens doubled, putting runners on second and third. A sacrifice fly would plate Bennett, bringing the score to 1-0. The Jackrabbits would strike back in the bottom half of the inning. After Black Bears redshirt third-year starter Jonah Normandeau retired the first two batters in the inning, first-year center fielder Landon Badger doubled to left field and then stole third. A single by first-year shortstop Jake Thompson plated Badger and tied the score at one. South Dakota State would tack onto the lead in the third. Third-year designated hitter Anthony Schneider was plunked to start the inning. After two flyouts, Normandeau walked the next batter he faced. Fourth-year first baseman Matt Johnson singled to right center, plating Schneider to run the score to 2-1. Johnson was thrown out trying to stretch his single into a double. The Black Bears struck back in the 6th. Bec led off the inning with a solo home run, tying the game up at two. The Jackrabbits pulled ahead again in the bottom half of the 6th. After a strikeout to start the inning, third-year third baseman Newt Johnson singled. Johnson scored on a double by Matt Johnson to get the score to 3-2. Johnson was thrown out at third trying to stretch the hit into a triple, but the damage was already done. Fourth-year right handed starter Ryan Froom was taken out after six innings of work, giving up two runs on eight hits with a walk and two strikeouts on the inning. Third-year right hander Derek Feige (0-1) came in relief and the Black Bears took advantage of the pitching change. Fourth-year right fielder Tyler Schwanz led off the inning with a single. Some wildness by Feige put Schwanz in scoring position, getting to third on two wild pitches. After a strikeout, Schwanz scored on yet another wild pitch, tying the game at three. Third-year left handed pitcher Connor Johnson came into relief of Normandeau, who gave up three runs on seven hits, walking one and striking out eight over the six innings of work. He would pick up the win with two innings of shutout relief effort, giving up three hits and no walks while striking out two. The Black Bears took the lead for good in the top of the eighth. Sardinas drew a walk with two outs, then advanced to second on yet another wild pitch by Feige. 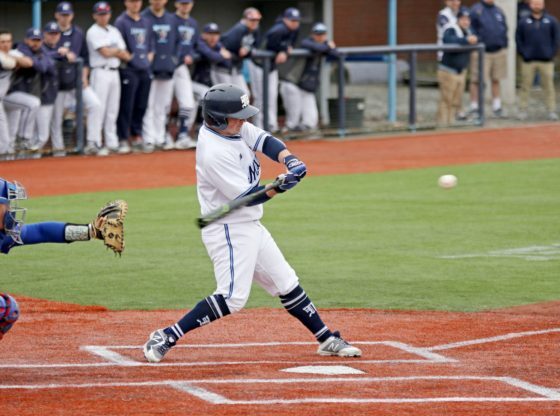 Sardinas would come around to score on a single by redshirt second-year second baseman Caleb Kerbs, giving Maine a 4-3. Fourth year right hander Jeff Gelinas nailed the door shut to pick up his second save of the season. The Black Bears are back in action with a doubleheader on Sunday, March 5 with the first game at 9 a.m. against the Jackrabbits and then again at noon against Central Connecticut State.